The day before I made the big pot of Beef and Bean Chili, I cooked up a pot of Beef Stock for the first time. It turned out good, and to my surprise was very easy and very much worth the effort. Homemade beef bone stock is inexpensive to make, and when made right and with good quality ingredients, it is nourishing and has health benefits as it’s rich in calcium, magnesium, phosphorus, gelatin which is good for your hair, nails, and joints, and glucosamine and chondroitin which is also beneficial for your joints. 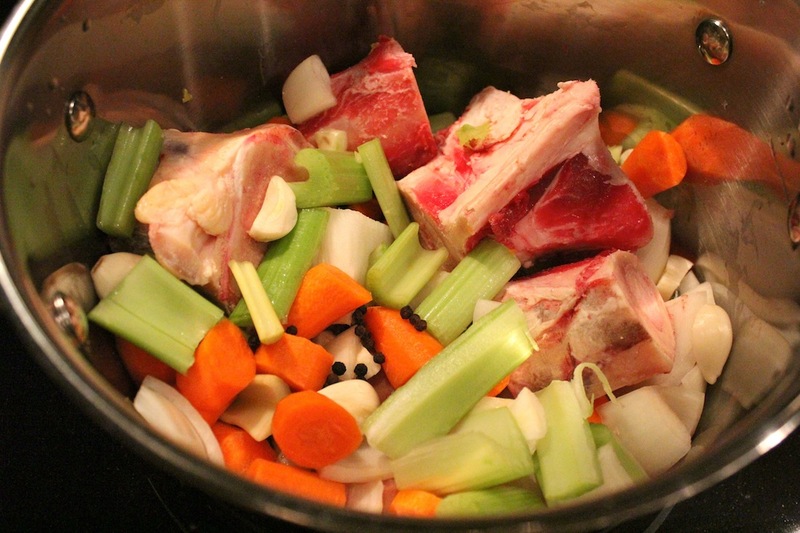 There is a good article here at Nourished Kitchen on the benefits and advantages to making your own bone stock. When I asked the Chef that I work for now for some suggestions on making beef stock, he said roast the bones first, and that he wouldn’t use much for fresh herbs in it, especially if you’re making a lot of it and freezing it for later. Then if you go to use it later on it would be good to use for just about anything, from a Stir Fry to a big ol’ pot of Chili or Beef Stew, or some gravies and sauces. He also suggested simmering it down for a long time to a very concentrated stock would be helpful if you are making a ton and your freezer space is limited. Then when you go to use it, just add water to reconstitute it. Well I kind of cheated and made up a quicker version. I didn’t roast the bones first, I didn’t add in vinegar (which helps the nutrients and minerals to leach out of the bones into the broth), and I didn’t let it simmer for 48 hours. 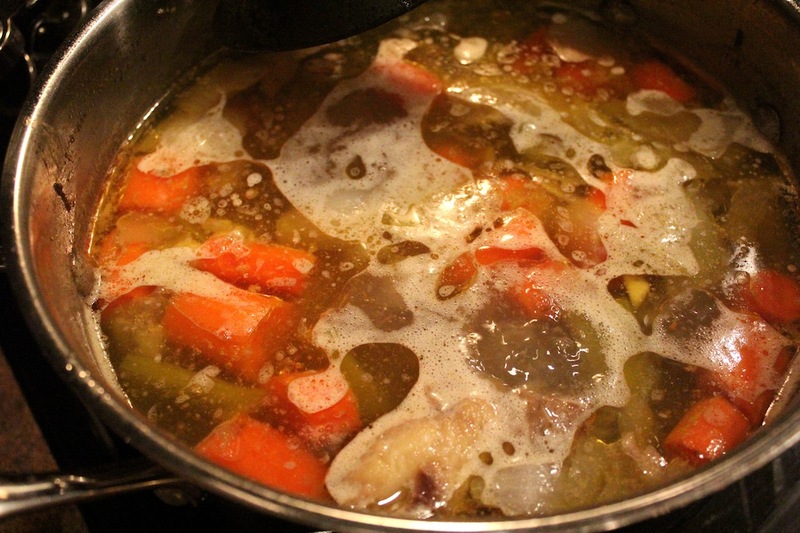 I just threw my beef soup bones into my stock pot along with chopped yellow onion, garlic cloves, carrots, celery, peppercorns, and filled the pot with cold filtered water. I brought it to a boil in the evening, reduced it to a light simmer and let it go overnight. After it simmered for about 14 hours, I strained it the next day, set it in the fridge to cool completely, then took it out to remove the top layer of fat. Voila, a beautiful and flavorful soup stock! It was really nice having a stock simmering overnight in the house too, made it feel really home-y. I woke up a couple times in the night to check on it and it felt kinda like there was really something special waiting for me in the morning, and the house smelled that way too! I did get some soup bones with all the meat from the yearling we got in the freezer, but for this stock I just stopped in to the local meat processing shop and asked the butcher for some beef soup bones. The bones have the marrow in them, and the more knuckles the better since those will give you a very gelatinous stock. It’s so easy to use those soup bones from the butcher since there’s no preparation with them and they are very inexpensive! 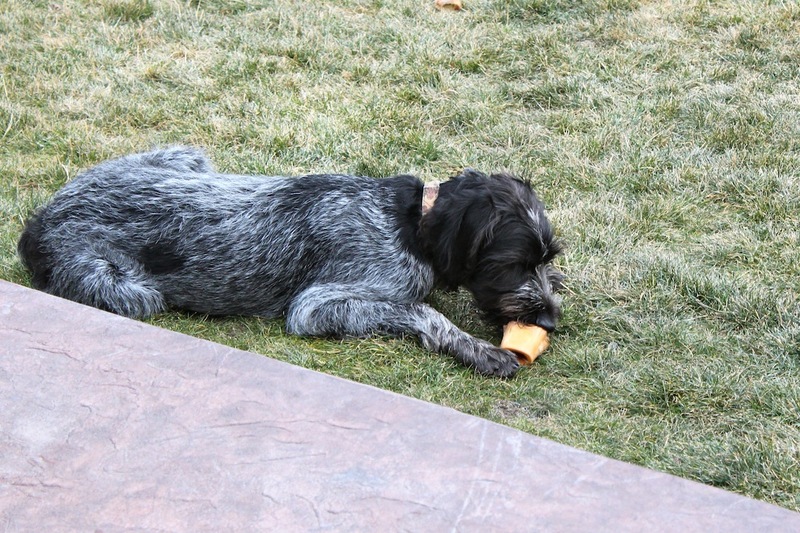 …Our furry friend Jackson really appreciates that I grab a bag of the marrow bones to keep in the freezer for him too! I recently started cooking with the grass-fed Montana beef we got stocked in the freezer this Fall from the yearling that my husband’s rancher friend butchered for us. The first thing I wanted to cook up with it was a big pot of Chili, and while I was at it I managed to make a pot of Beef Stock too. It all turned out so good, there’s nothing better than a big bowl of hot, homemade, heartwarming soup or stew, with a little bread to go with it this time of year. Since the ground beef and stock was as local and all-natural as I can get it, I decided to soak my beans to keep it healthy and nourishing. I used kidney beans and black beans, covered them with warm water and a little lemon juice in a large bowl to soak overnight, then after 15 hours of soaking they were drained and rinsed, then covered with water in a pot and simmered for about three hours. With the help of my cousin over at Born in the Wrong Century, reading this blog post over at Nourished Kitchen, and my Nourishing Traditions cookbook, I have recently learned a little about the benefits of soaking beans, grains, and legumes before cooking them. Basically soaking is an old traditional method of preparing and cooking these items and it enhances the nourishment and nutrient value in them by reducing the effects of the anti-nutrients, the phytates and enzyme inhibitors, which keep the minerals from being absorbed by your body. This preparation neutralizes the phytic acid and enzyme inhibitors and breaks down the difficult-to-digest complex sugars. This then allows them to be completely digestible and the essential minerals and nutrients to be well assimilated and absorbed. I can definitely tell a difference when I eat Chili made with soaked beans (vs canned), there is almost no problem with gas or bloating, no need for Bean-o!! And the taste and texture is so much better. 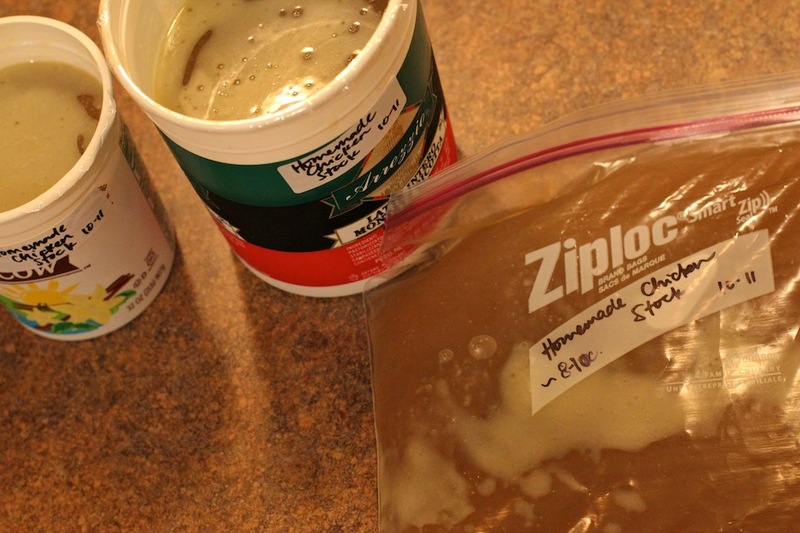 If you’re wanting to learn more about soaking, the links above are a good place to start. Place dry beans in a large bowl and cover with warm water, add in the lemon juice. Set aside in a warm place for 12-16 hours. Drain out the soaking water, rinse, pour beans back into pot and cover with water, and add in optional spices: 3 T chili powder, 1 T garlic powder, 2 T kosher salt, 1 T black pepper. Bring to a boil, skim off foam, reduce heat, cover and simmer for 2-4 hours, adding water as necessary to keep beans covered. Cook until they’re tender but still a little firm… al dente. Heat about 4 T olive oil in bottom of a large soup pot, when hot add in onion and saute until translucent, about 5-7 min. Add in garlic, cook 2-3 min., sprinkle in salt and pepper, add carrots and saute another 5 min. stirring often. Add ground burger and cook until browned, meanwhile adding in the chili powder, oregano, red pepper flakes. Stir in tomato paste, crushed tomatoes and diced tomatoes along with their juices. Stir and then add in enough soaked beans and beef stock to get desired consistency. Let simmer 1-2 hours, salt and pepper to taste. Well that’s about what I did, when I make big pots of soup I just throw it all in as I go, cooking up all the layers of flavors. So these are not my exact* measurements, but very close. We just got done eating this Chili for the last four nights, and I’m telling you, no gas/indigestion/bloating problems at all! 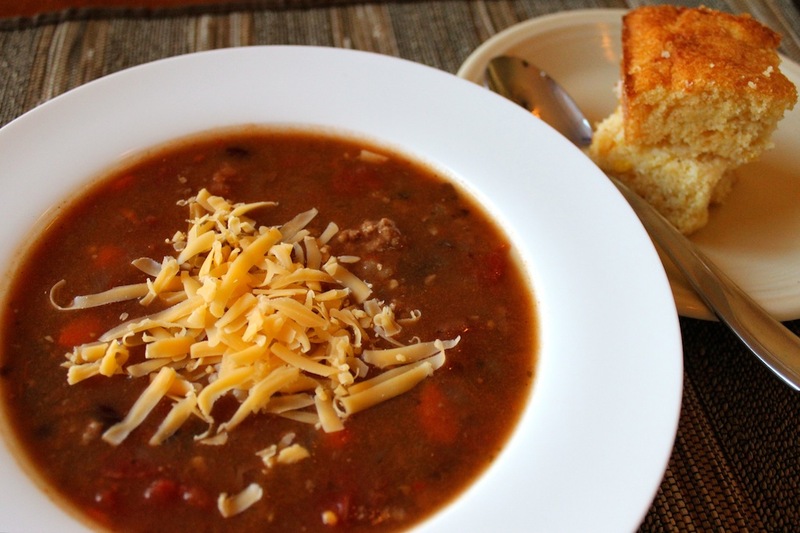 It’s a very flavorful, comforting, old fashioned Chili. If you’ve never got into the habit of soaking your beans before cooking with them, I hope you are inspired to try it out! It takes some thinking ahead, but really is quite simple to toss them in a bowl covered with water and lemon juice in the evening and let them set until you cook ’em up the next day. I also like to soak black beans overnight, simmer the next day, then keep them in the fridge to use for burritos and yummy mexican dinners for the week. From the way I’ve been cooking lately and having chicken recipes on the blog, you’d probably think it’s the only meat we eat around here. Really it’s not! And it’s about to be changed up a bit soon, as we’re about to get our half of a Beef next week in our freezer!! I’ll talk more about that later when we get it and will be cooking up some fun dinners with ALL of that hundred-something pounds of beef! But for now, I’ve been on a roll with my chicken stock and just made one of our favorite soups with it a couple days ago. 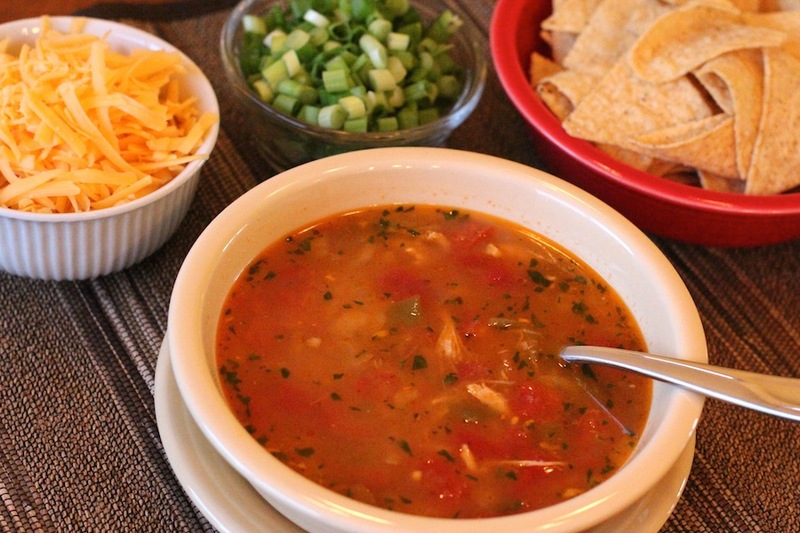 It may be our absolute, all-time favorite soup, but is it even possible to have one favorite?? 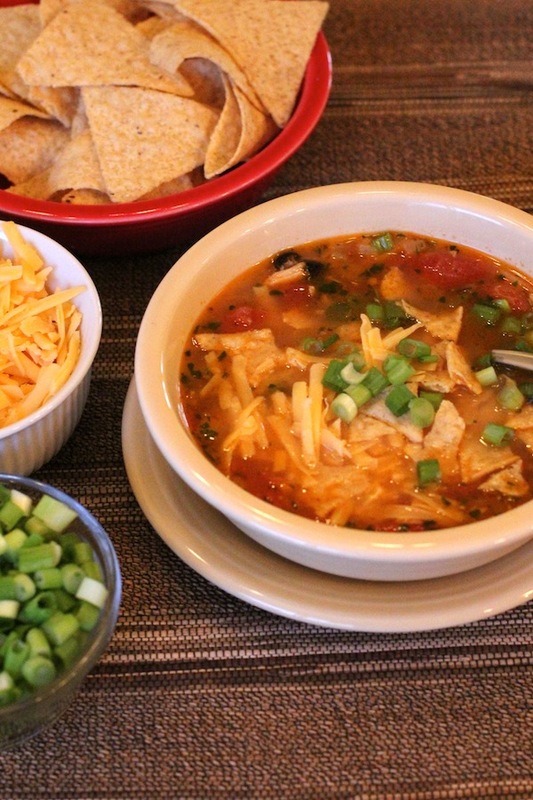 I made this Chicken Tortilla Soup last winter when I was getting over a cold and just wanted a chicken broth/soup that was warm, comforting, and had a little bit of heat and spice to it. So I brewed up the idea in my head, wrote down all the ingredients I wanted in it, and then cooked it up how I thought would be best. Turned out that hubby and I loved it! Then a friend came over and I dished him up a bowl and received one of the best compliments. He said something like, “I feel like I’m at a nice restaurant, and should be wearing a tie or something”. I was so happy to hear that. It is everything you would want from a soup and more. 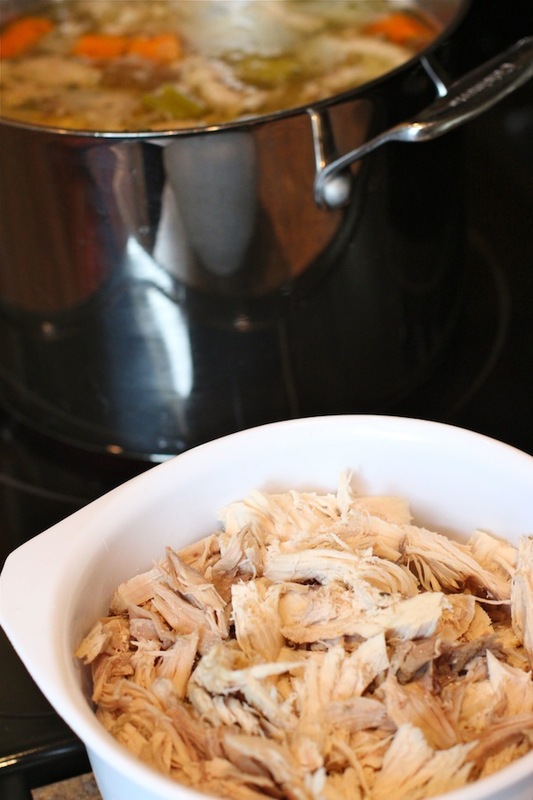 Warm, comforting, soothing, with a bit of heat, so flavorful, all in a chicken broth that is thickened just slightly with a little flour sprinkled on the meat during the sautéing. It has all the textures you’d want, with the chicken, beans, etc. to sink your teeth into, and the crunch from the tortilla chips. This time I decided to go all out, I made a pot of Chicken Stock, got the strained stock in a pot to stay warm on the stove, then in the stock pot made the soup with the meat that I pulled off the bones halfway through simmering the stock. You can definitely make this with store-bought stock and one or two chicken breasts, which is how I did it the first time. It’s wonderful both ways. But whatever you do, just make it!!! If you do use stock and meat from the store or just pulled out of your freezer, it is a quick one to cook up since most of the ingredients are canned and you don’t have to chop, slice, and dice a ton of produce to prep for it. [If chicken is not cooked yet, cut a couple breasts into cubes, heat olive oil in large soup pot and saute chicken just until cooked. Set aside in a bowl and return empty pot to stove.] Heat 3-4 T olive oil in large soup pot over med.-high heat and saute onion until translucent. Add in garlic and jalapeno and let cook a couple minutes. Stir in cooked chicken, sprinkle in the cumin, chili powder, and s+p and stir it up. Sprinkle the 3-ish T flour onto the chicken, stir and cook 3-5 minutes to cook out the raw flour taste. 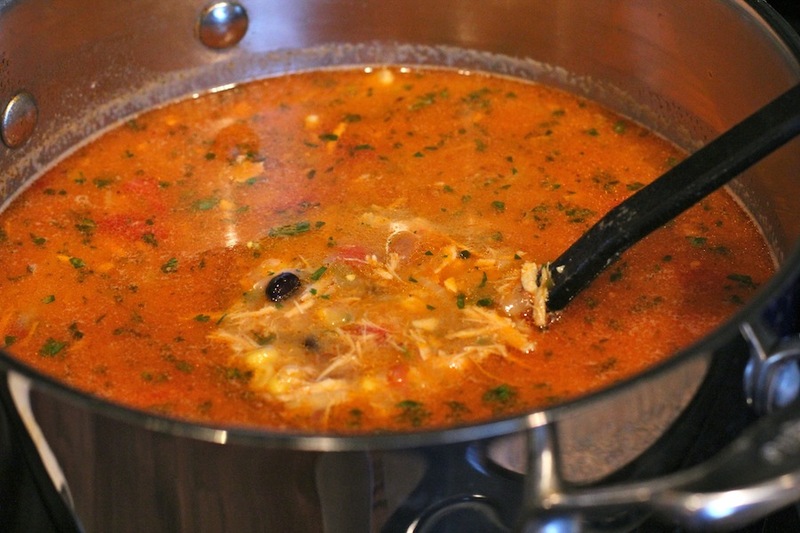 Pour in diced tomatoes, enchilada sauce, and chicken stock, stir and let it heat up to a simmer. Pour all the beans in a colander, drain and rinse, add the diced green chilies, then stir it all into the soup. Add in the frozen corn, a handful of grated cheddar, and cilantro. Salt and pepper to taste, and adjust the level of heat to your preference, adding a bit more minced jalapeno or a pinch of red pepper flakes for a little more kick. If you have kids or don’t like much heat, just omit all of the peppers. 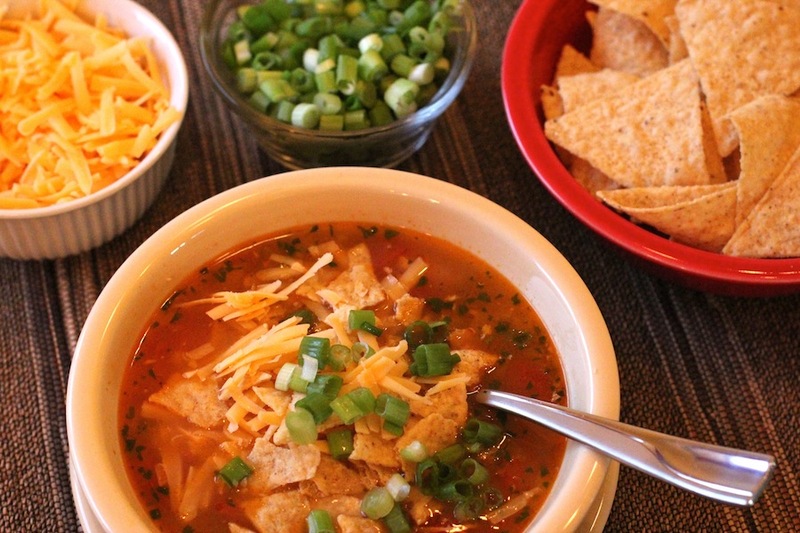 To serve, dish up into bowls and sprinkle with green onions, cheese, and crush tortilla chips on top. YUMMMYYY!! Enjoy! Well the beauty and chill of Fall came and set in so quickly, and it feels like winter is just around the corner. Even though it’s getting colder and darker every day, I have been thoroughly enjoying Fall this year. The changing weather and colors are so inspiring to be knitting up something wooly and warm, and cooking up something warm and comforting in the evening. One of my favorite things is having homemade soups and stocks in the freezer all winter. It’s so great to pull out on those cold nights when you don’t feel like cooking but just want something homemade and warm. I buy whole local Hutterite chickens at the grocery store here, and usually get 2-3 at a time so I always have some on hand. It’s less than $2/lb this way, and so nice to know where it comes from. 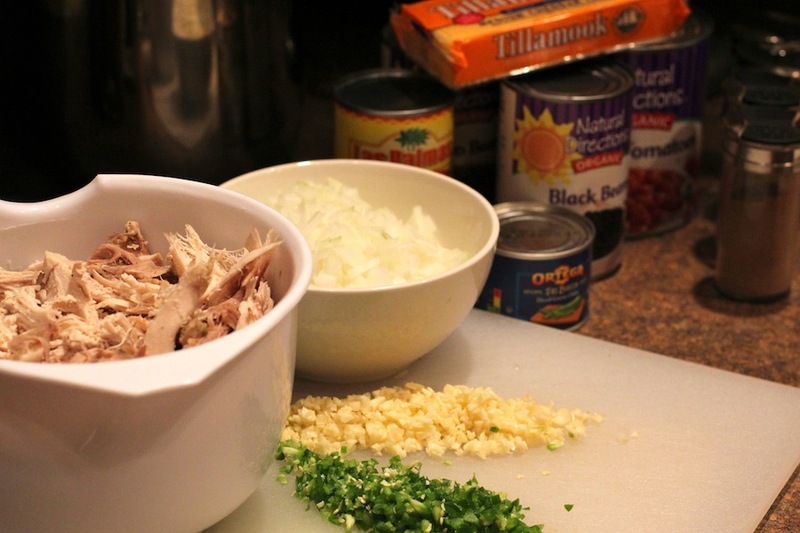 Rinse the chicken and set in stockpot, whole or cut into pieces. Toss in the remaining ingredients and cover with 7-8 quarts of cold water. 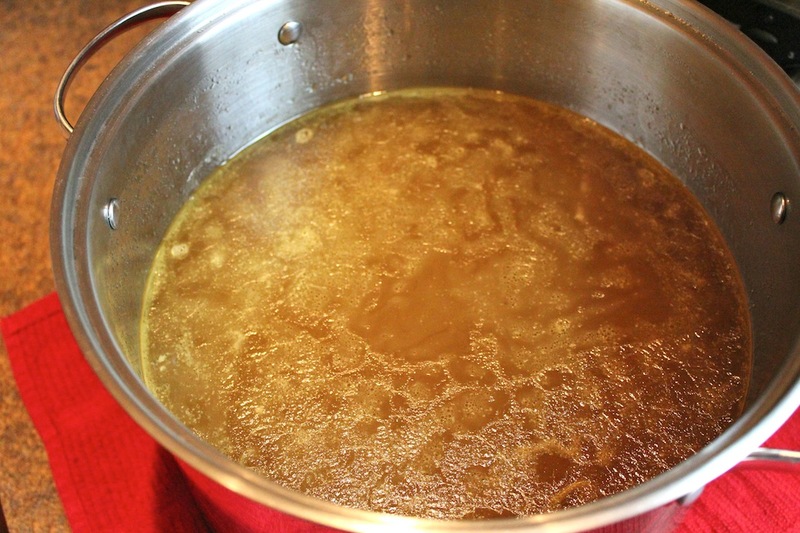 Bring to a boil on high heat, once it reaches a boil reduce to med.-low so you maintain a gentle simmer. Skim off the foam/scum off the top often during the first hour and a half of cooking. Simmer uncovered 4 hours, adding a little hot water as needed to keep everything submerged. Halfway through the cook time, you can remove the chicken with a tongs from the pot onto a cutting board. Let it cool enough to touch and peel off all the meat and use this later in soup, pizza, burritos, etc. Return the carcass and bones back to the pot and finish cooking. 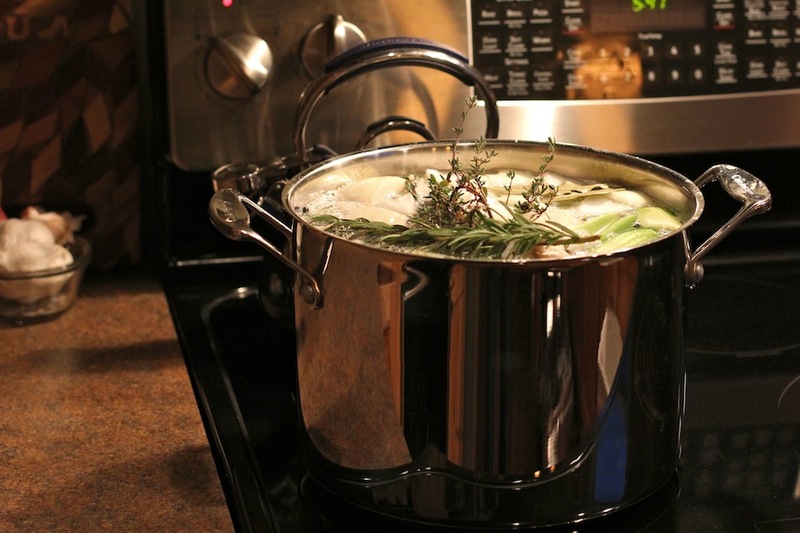 Strain stock through a fine mesh strainer into another large stockpot or heatproof bowl and discard all of the solids. Cool immediately in an ice bath or fridge, store in fridge for up to 3 days, or pack in containers and freeze for up to 3 months. 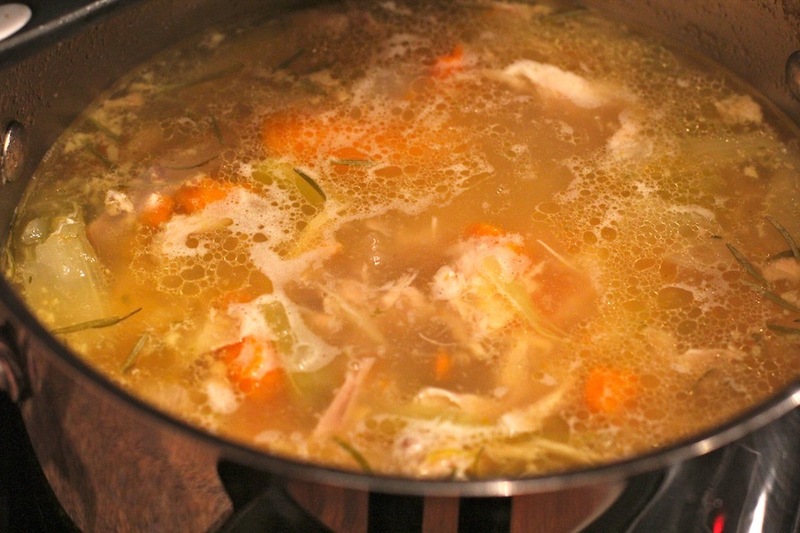 Here are a couple more good posts on chicken stock, from The Nourishing Cook and Nourished Kitchen. At the restaurant I work at, the chef cuts all the whole Sage Creek chickens into the pieces he needs for one of his dinner entrees, then sets all the carcasses on a large baking sheet and roasts them for 40-ish minutes. 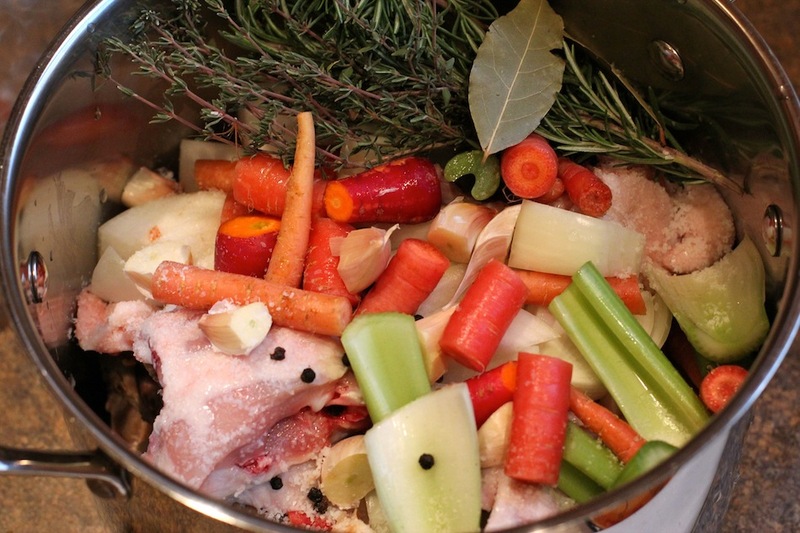 Then sets them in a large stockpot and makes stock with the roasted bones. Whether you do it that way or with it whole, meat and all, it’s bound to be delicious, good for you, and so rewarding. 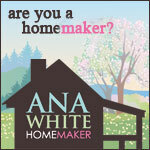 …And make the whole house smell wonderful!